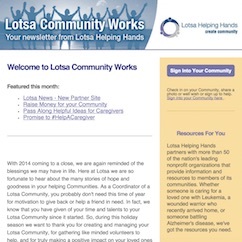 Our newsletter, Lotsa Community Works showcases Lotsa communities of support, offers advanced tips for using the service and highlights new features of Lotsa Helping Hands. Are you looking for caregiving resources? Are you interested in helping a caregiver? View previous newsletters in our archive.